The new Sizzix die cutters available now at Ben Franklin Crafts are sizzling HOT! The Big Shot machine will accommodate even the large purse booklet die cutter. I’m having so much fun making mini purse albums to document my shopping sprees. The purse booklet and pages could easily be the focal point of a paper party, office crafting session, or even a teen’s birthday celebration. Provide bowls of embellishments (maybe instead of refreshments) and you’ll have an instant success. I also love the Flower Beauty Blossom die cutter, which makes four petal parts of a blossom. 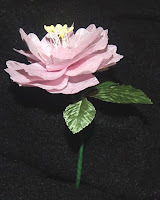 I found that cutting four layers of (Japanese) mulberry paper at once makes a gorgeous peony-like flower. (See photo. Click to enlarge.) To make the blossom more realistic don’t use the smallest petals and add yellow pips along with leaves from our floral department. Fold in half and wrap green floral wire stems around the pips and then pass the two wire ends through the petals. Wrap green florist tape around the stem and add in the leaves as you wrap. The resulting flower would make a great gift topper instead of a bow or be an easy, elegant, inexpensive wedding decoration. I love the K. and Co. book of 32 punch-out cardstock purse boxes. The pastel colors and printed designs are so feminine. I also like that in the thick booklet there are two purses of each reversible design and there are sixteen different purse shapes complete with embellishments to punch out. Pictured here is a purse/luggage box I made for my niece. I added my own ribbons and yarn plus flowers from American Craft’s Greenhouse container of flowers combined with sugar-coated brads from Doodlebug Designs. I used clear stamps from Hero Arts and Studio G to print small birthday messages on the punched out tags. I think the resulting box is really cute and perfect to contain a small gift of lip gloss and cash. Because there are 32 purses in this booklet, they would make great favors at a teenage girl’s party. If you wanted to make the favors all the same you could use one of the unfolded purses as a template and cut identical ones from cardstock. I like the fact that the booklet just has just a picture of each finished purse and not precise instructions. This allows you to get a basic idea but the freedom to improvise. 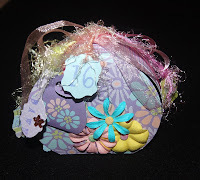 By giving party guests a variety of embellishments, the making of the purse box could be an icebreaker activity and the boxes could be filled with candy or makeup. (There are also other books from K. and Co. that make non-purse shaped boxes.) Now, I need to mail this soon-to-be-belated birthday gift. For me, this time of the year (besides being a lei-making season) marks the poignant passage of youth. I can’t help wondering if the graduates know what lies ahead of them without the safety net of a structured school system. Even if the student continues to college there will be so much freedom that they might crash from the exhilaration of too many unsupervised choices. Therefore, it is with congratulations and trepidation that I made and mailed graduation cards. I found the Hero Arts Clear Designs rubber stamps called Happiness Messages to be very appropriate as sentiments for graduation. (See photos. Click to enlarge.) The hula girl card was made to go with the graduation lei necklace (in the recycled corrugated soap box) featured in this month’s website project. Gift money can be slipped behind the front card that is woven in the slits of the back card. 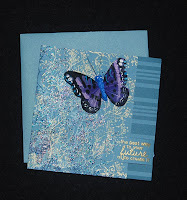 The butterfly on the other card is from the floral department at Ben Franklin Crafts where there are many choices of bugs and birds made from real feathers. Well, I need to work on a card and gift for a niece, whose birthday I forgot…sigh, getting old.